I am a sucker for a pretty dessert - give me a mug of steaming hot Chai and pretty plated dessert and I'm in 7th heaven. Beautiful desserts don't need to take a lot of time to create, sometimes the simplest of desserts are the most pleasing to the eye. 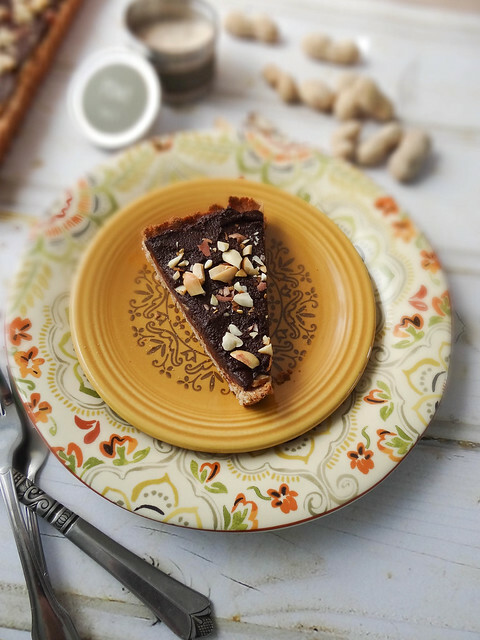 Take this tart for example - minimal ingredients, no refined sugar, a helping of healthier than average ingredients plus pretty plates and you have yourself a super awesome dessert that plates up even prettier. I love desserts that look like a lot of effort but can be made in no time at all. 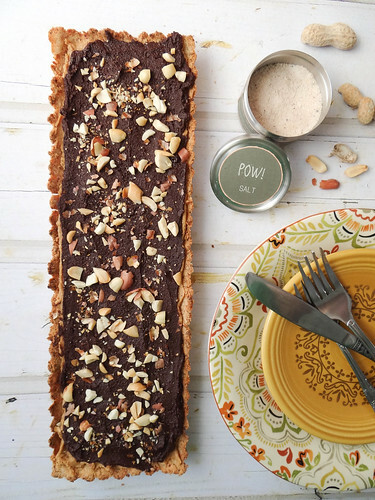 Peanut Butter, Maple Syrup, Raw Cacao & Coconut Oil are the main ingredients in the filling. The crust is a mixture of gluten free flours, dates and coconut oil - making this suitable for your gluten free & vegan friends! If you don't find yourself with a rectangular tart pan a round one will do - no tart pan at all? Line a pie plate with parchment and go to town. Mini tarts would make an adorable addition to any Dessert Table. Speaking of Mother's Day, I love getting together for a late Breakfast or early Lunch with my Mom - this year will be even more special as my Sister is back home and will be able to join us for the first time in over 4 years. This year we will also be celebrating our nephew's 3rd Birthday & my Cousin's Wedding the night before - it will definitely be a celebratory kind of weekend! 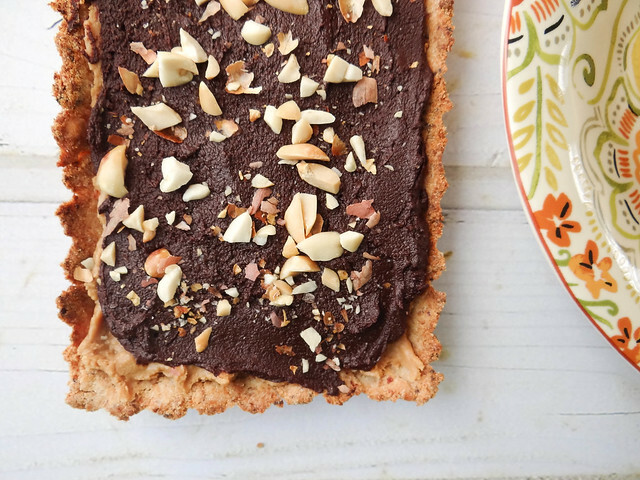 The only "baking" component to this dessert is the crust- which takes a mere 10-15 minutes to bake up. 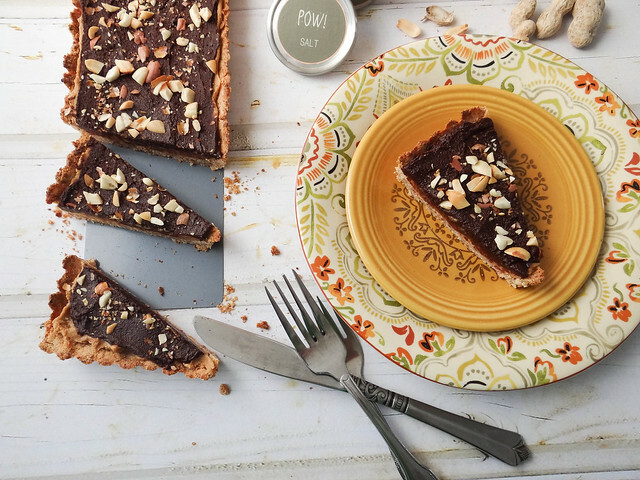 Everything else is done on the stove top - you could take this tart to the next level by using this raw crust and skip the oven all together! Totally your call, it would be excellent either way. The POW! Salt from this post is the perfect accent for this dessert - if you haven't already, you should make a couple batches, save one for yourself and give one to your Mom- she will love it, guaranteed. Mom's love all things homemade, especially when the gifts are made by their kids. Do you have a weakness for pretty desserts? What plans do you have for your Mom or the "Mom's" in your life? For other Mother's Day Inspired Dishes, check out the links below! Flaky Salt - POW Salt! 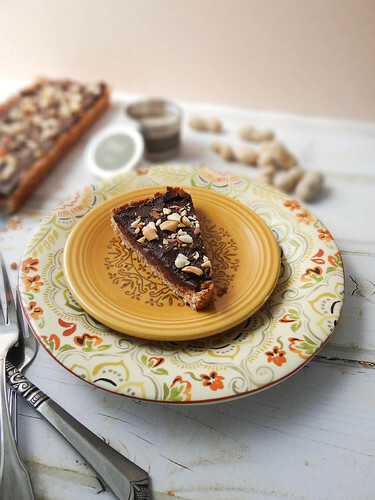 Press the dough into bottom and sides of a rectangular or round tart pan. Bake in the oven for 12-15 minutes or until lightly golden. Remove from oven and place on a wire rack to cool. While the pastry is baking, place a small sauce pan on the stove over medium heat. Add peanut butter, maple syrup and began butter to the pan, stir well until the peanut butter is ultra soft - almost liquid like. 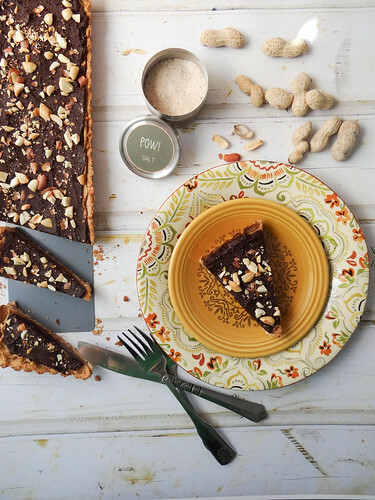 Pour the peanut butter mixture over the tart pastry- using an offset spatula evenly smooth out the peanut butter. Rinse the small sauce pan. In the rinsed sauce pan, over low-medium heat melt the coconut oil - slowly whisk in the raw cacao and maple syrup. continue to whisk until smooth, about 30 seconds. Pour the chocolate over the peanut butter, using the offset spatula evenly spread out the chocolate later on top of the peanut butter layer. 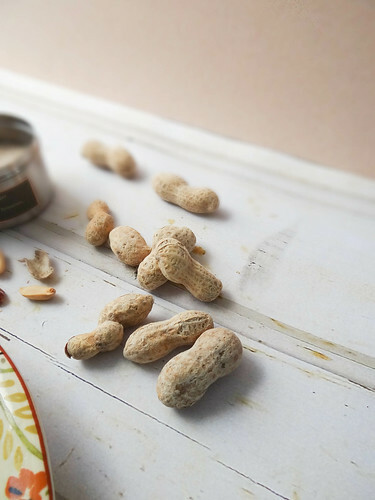 Sprinkle chopped peanuts over the top along with a generous pinch of POW Salt. 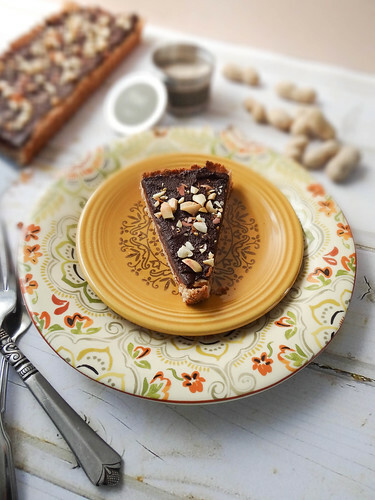 this is a perfect mother's day tart! considering my mom LOVES chocolate and peanut butter, this is a must! I can't wait to try this!! So fun! Gorgeous pictures! This looks absolutely divine! Your pictures are beautiful! 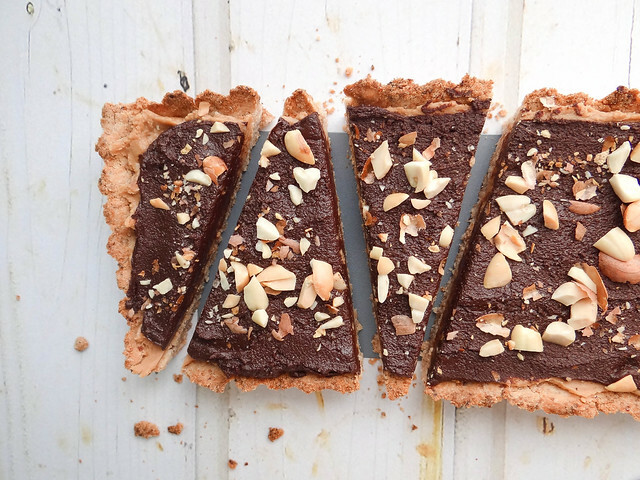 This tart looks incredible. Perfect for summer! 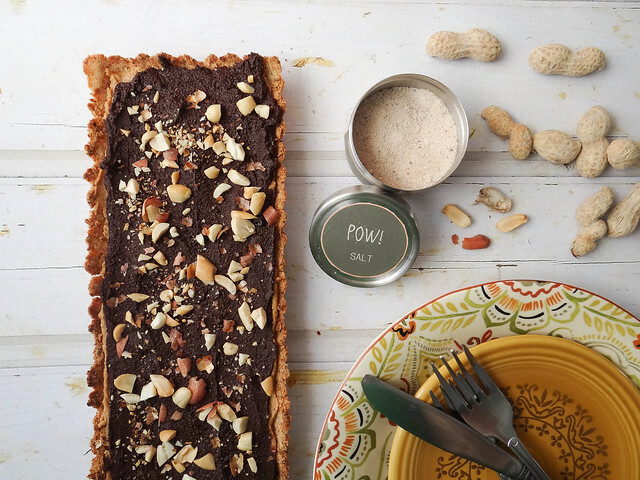 I love love love the flavors going on in this tart and that Pow salt is so cute! oh my... Peanut butter, chocolate AND maple syrup?? This must taste like heaven!! 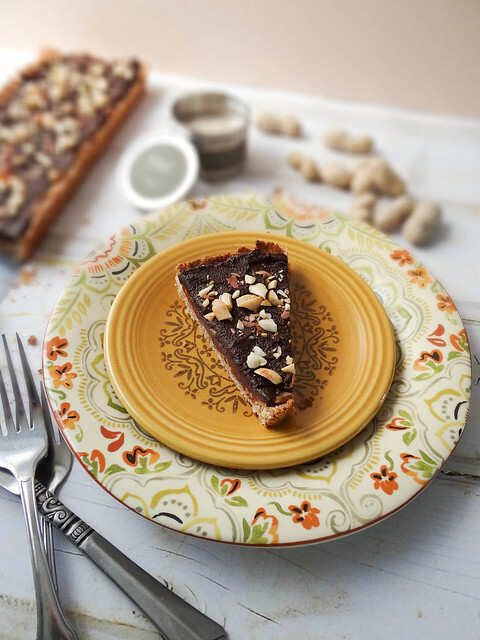 My Mum would (will ;)) love this tart! 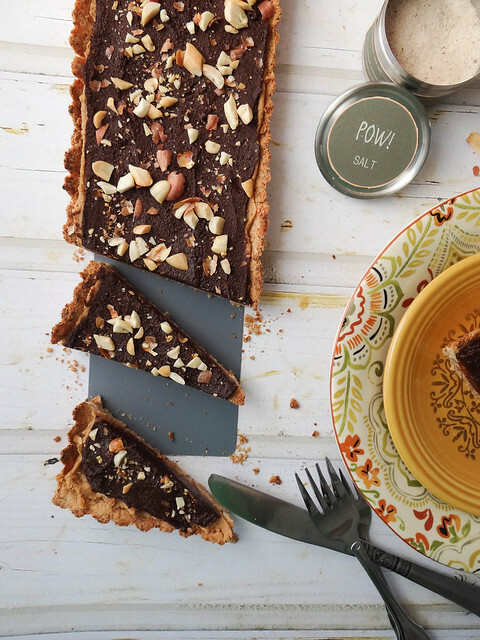 I don't have a sweet tooth but tart is one of my fav, mainly because of the flaky crust. I feel it helps cutting down the sweetness of the feeling making a perfect balance for my palate. This is great dish for the occasion. this is one pretty tart! and i love it that it comes together easily!! Do you think it would be as effective with Almond Butter? This looks beyond amazing! Wow! 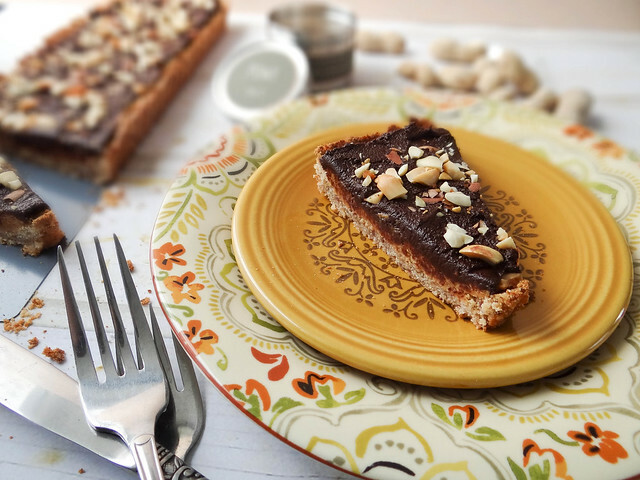 Peanut butter chocolate tart......DELICIOUS! I cannot wait to give this a shot. It's gorgeous! 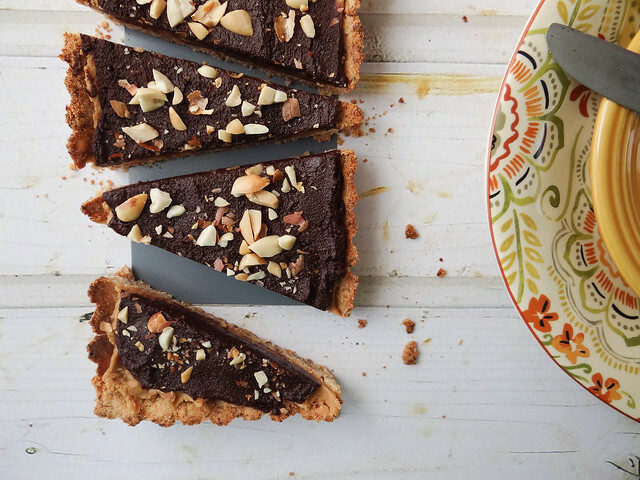 How cute and seductive that dark Tart looks ! I love the layers of flavor in this dish! What an elegant dessert!